The Chernobyl disaster occurred at 01:23 a.m. on April 26, 1986 at the Chernobyl Nuclear Power Plant near Pripyat, Ukraine, at the time part of the Soviet Union. Reactor 4 suffered a catastrophic steam explosion that resulted in a fire, a series of additional explosions, and a nuclear meltdown. It is regarded as the worst accident in the history of nuclear power. A plume of radioactive fallout drifted over parts of the western Soviet Union, Eastern and Western Europe, Scandinavia, the British Isles, and eastern North America. Large areas of Ukraine, Belarus, and Russia were badly contaminated, resulting in the evacuation and resettlement of over 336,000 people. About 60% of the radioactive fallout landed in Belarus, according to official post-Soviet data. A reasonable central estimate is about 4,000 fatal radiation induced cancers during the lifetime of the 600,000 most highly exposed individuals and perhaps another 5,000 in more peripheral populations. The number is small (representing a few percent) relative to the normal spontaneous risk of cancer, but the numbers are large in absolute terms. Among the 4,000 is included some 50 emergency workers who died of acute radiation syndrome and nine children who died of thyroid cancer, and an estimated total of 3,940 deaths from radiation-induced cancer and leukemia among the 200,000 emergency workers from 1986-1987, 116,000 evacuees and 270,000 residents of the most contaminated areas (total about 600,000). These three major cohorts were subjected to higher doses of radiation amongst all the people exposed to Chernobyl radiation. The estimated 4000 casualties may occur during the lifetime of about 600,000 people under consideration. As about quarter of them will eventually die from spontaneous cancer not caused by Chernobyl radiation, the radiation-induced increase of about 3% will be difficult to observe. However, in the most highly exposed cohorts of emergency and recovery operation workers, some increase in particular cancers (e.g., leukemia) has already been observed. Confusion about the impact has arisen owing to the fact that thousands of people in the affected areas have died of natural causes. 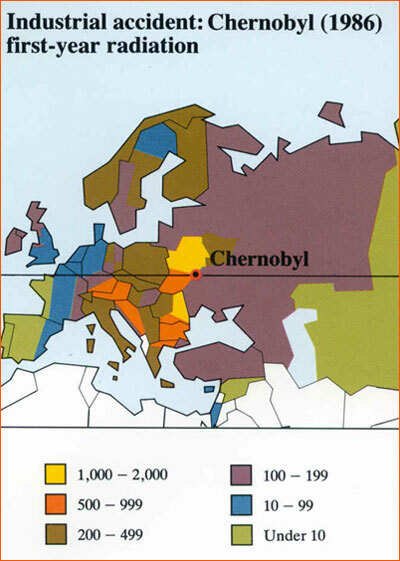 Also, widespread expectations of ill health and a tendency to attribute all health problems to radiation exposure have led local residents to assume that Chernobyl related fatalities were much higher than they actually were. Ecosystems affected by Chernobyl have been studied and monitored extensively for the past two decades. Major releases of radionuclides continued for ten days and contaminated more than 200,000 square kilometers of Europe. The extent of deposition varied depending on whether it was raining when contaminated air masses passed. Most of the strontium and plutonium isotopes were deposited within 100 kilometers of the damaged reactor. Radioactive iodine, of great concern after the accident, has a short half-life, and has now decayed away. Strontium and caesium, with a longer half life of 30 years, persist and will remain a concern for decades to come. Although plutonium isotopes and americium 241 will persist perhaps for thousands of years, their contribution to human exposure is low. How many “Chernobyl-type” reactors are still operating in the world? Chernobyl-type reactors are operating only in Russia and Lithuania. They technically are known as “RBMK” or sometimes “LWGR” plants. They are water-cooled and graphite-moderated reactors. RBMK is a Russian acronym for high-power-channel reactor. Russia operates twelve such plants for electricity generation at Kursk, St. Petersburg, and Smolensk; additionally four small units remain in use for local heating and power at Bilibino in Siberia. Lithuania’s plant is known as Ignalina. One of the two units has been shut down, and the other is scheduled to close in the near future.